These are some more of my yardbirds that showed up to be counted last weekend for my GBBC- the Great Backyard Bird Count. Lately our electric blinks or goes out for awhile so I created this post early. The weather forecasters are calling for rain and heavy winds on Friday..which could mean our electric goes out and stays out..I hope it doesn't but just in case I wanted to schedule this post for my critter party on Saturday.. If you do not see me commenting..you will know why..
Update..Looks like the storm passed by with no damage..I may still be away from the computer for awhile today..but I will catch up with comments and visits. Blue Jay with a mouthful. American Goldfinch..poor thing..looking up and is thinking snow again..REALLY. Carolina Wren..I've been seeing two of these cuties hanging around my deck..I think they already claimed one of my birdhouses as their own..
Tufted Titmouse, they are having fun chasing each around the yard..
Song Sparrow stopped by for the count along with the White-throated Sparrows and some House Sparrows. Thank you in advance for linking up and joining in on Saturday's Critters.. I always appreciate the visit and comments..
Also please visit: I'd-Rather-B-Birdin. Thanks to the gracious host: Anni of I'd Rather-B-birdin. Also, sharing with Camera Critters. Thanks to Misty for hosting. Thanks for stopping by and I wish everyone a happy weekend. bei dir ist der Winter noch voll da.. So sorry you may have bad weather and no power. Thanks for placing my link I love the Blue Jay with the peanut in its mouth. And the Wren is a real cutie. Thanks for sharing. Beautiful photos, Eileen! These birds are such a joy to see! Love 'em all...but the wren, being that they're scarce here, I would love to see one! Love your photos of these cute little birds! Wow, so sweet all of them♡♡♡ I really smiled with the "American Goldfinch..poor thing". I love the blur back with cute cold looking face. I hope the weather is not too bad, and that it is not electric outage. What lovely visitors you have! They're all gorgeous. Hello Eileen! !Great post! !Amazing captures! !Your yardbirds are very beautiful! !I like the Blue Jay! !So cute! !Have a happy weekend!Hugs! Thanks for posting so early! I'm expecting grandkids and won't be on-line later, either! 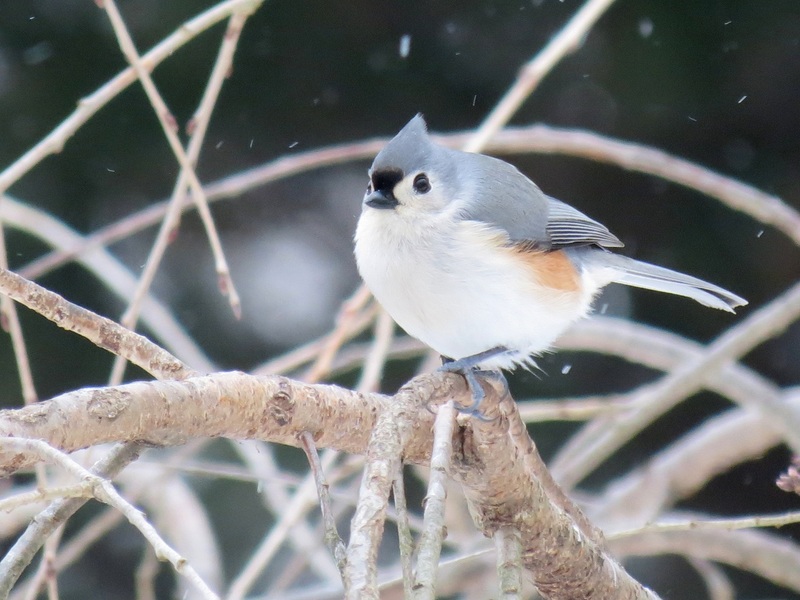 I love the Tufted Titmouse! I've never seen one! So neat to have all those birds right in your own yard! I never get over marveling. 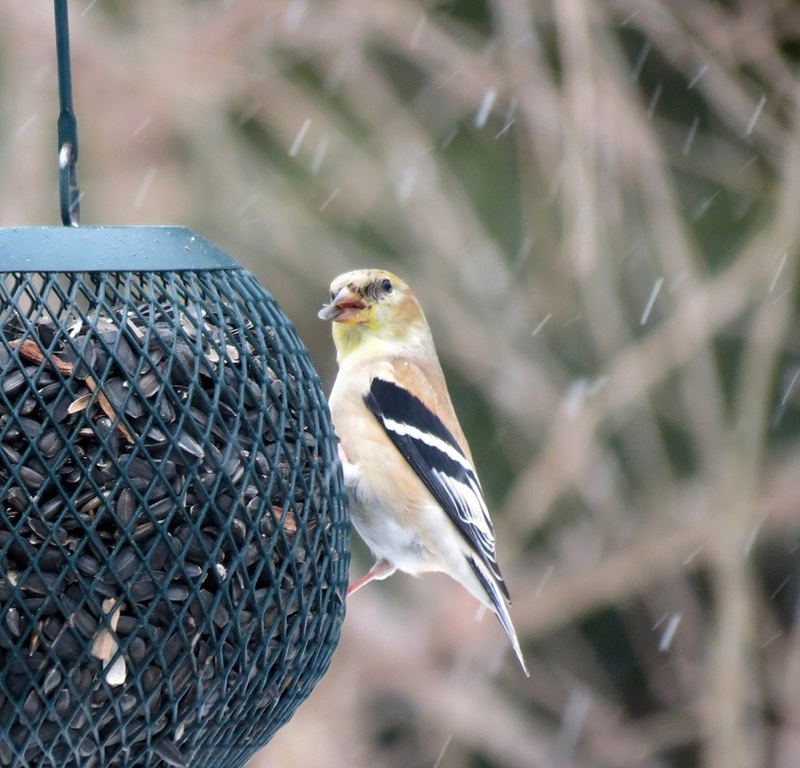 That poor little goldfinch does look like he's thinking he's just about had enough of winter! A stunning set of pis again Eileen, really good on the eye. A lovely set of photos again. I like seeing all the variety of birds that visit your yard. The little ones look so cold in the snow . . . enjoy some birding this weekend. I am excited, believe it or not, I see sunshine peeking in through the windows. Yay! an awesome group eileen, you are so blessed to have such a nice varity of birds. you captured them in some of their favorite poses!! my first "not a bird" entry, it wasn't easy for me!! LOL! 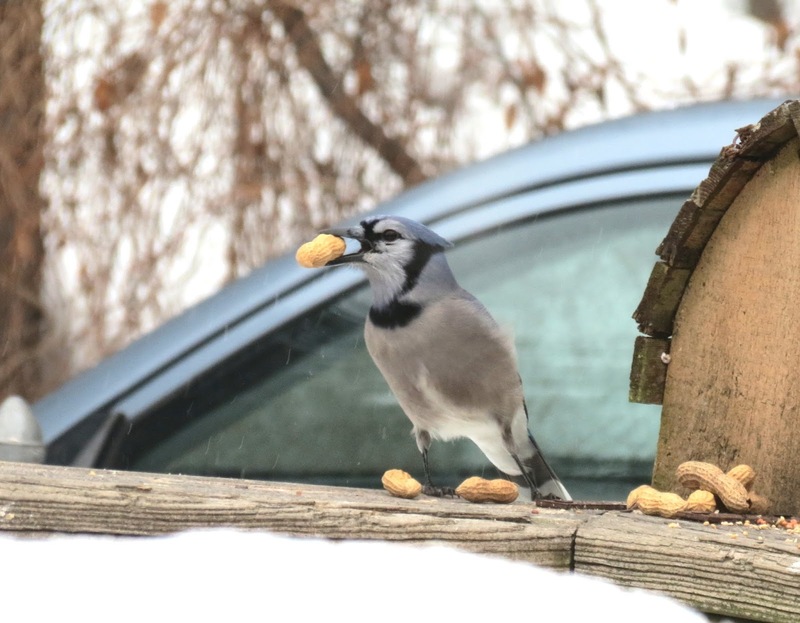 No matter where they live, the jays like the peanuts! Great shots of the Titmouse and sparrow! Nice visitors for your bird count. Jays seem to always have something in their mouths! Love the little titmouse. Happy Critter Day! a lovely bunch. thanks for hosting! Eileen, your garden birds are beautiful.......it must be difficult for many to find food in this weather. Have a lovely week - whatever the weather! I hope the storm doesn't come your way and that you stay safe and warm. 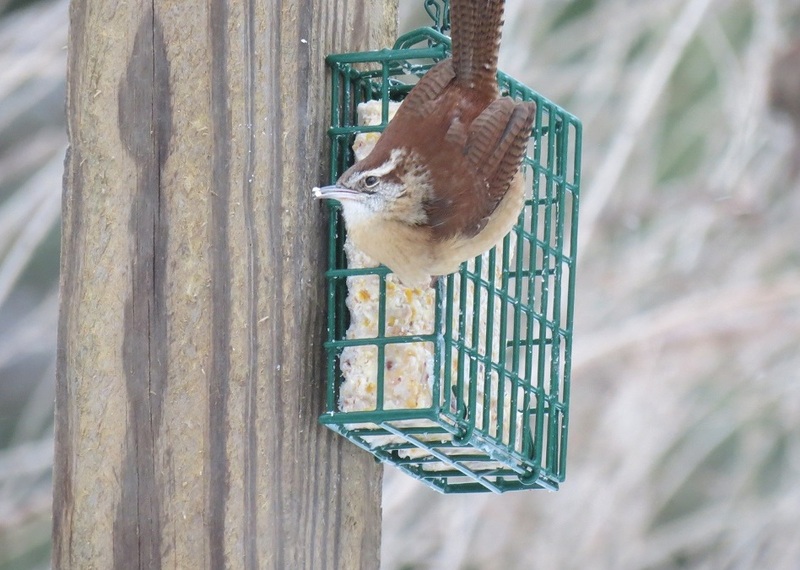 The Carolina Wren is so sweet looking. 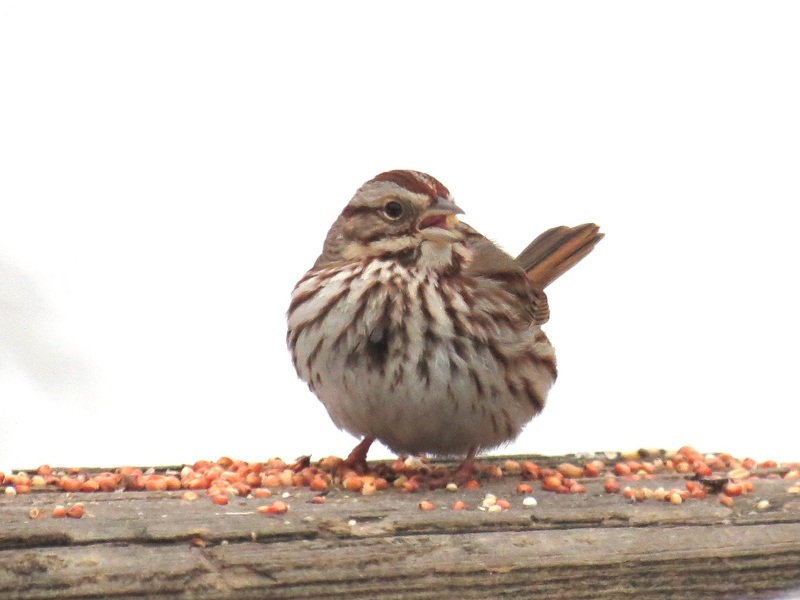 It's lovely to see a bird in your backyard that I've actually seen - a Song Sparrow. The Goldfinch does look a bit fed up! I love the different birds - and I bet they are glad for the food you put out. We have a bit of snow today - but it will melt fast I'm sure -as it turns to rain later. Love all your yard birds. Wish I could get more of them here. I will see more birds when spring comes. You really have very beautiful birds in your yard! I am glad that through you I see great birds. You see such a wonderful variety of birds at your feeders,Eileen! I like the tufted titmouse ..he is so chubby! Those birds are in cold but still look pretty. Take care Eileen, stay safe and warm there. HI Eileen Marvellous selection today. I have just arrive on i.o.w. Thanks for hosting. You've inspired me to try one more time with the bird feeder. I put it on the porch this time..maybe I can fool those mean old cowbirds. Rain and heavy winds are what we had here last week. I'm glad the storm passed by you with no damage. I love all of your little yard birds especially that cute little Tufted Titmouse. Hi Eileen, What beautiful bird photos. Hope you are enjoying the weekend. We've been out all day so I'm late visiting. You've captured some good photos of birds eating or just posing for you. The jay with the peanut looks pretty happy. I love the big eyes of the titmouse, but the big mouth of the jay is almost as interesting. This is making me miss my Blue Jays. I haven't seen them for awhile. We've had many blackbirds lately. For some reason known only to our internet connection, I'm having problems posting a comment on your blog ...I hope this comes through--Sorry if it's more than once...But I'm glad you made it through that strange weather on Friday, and I hope your sweet little birds did too!! Beautiful are your bird photos! ...thanks for linking up at the Bird D'Pot this weekend. And, hope your storms stay away now, 'til next winter. Nice feeder birds! I miss having a feeder here in south Florida but the Muscovy Ducks, pigeons and Monk Parakeets just take over and spill all the see within minutes. This must be a bird park. It's a real shame about the continuing bad weather in your part of the world Eileen. I hope things improve for you soon and that you don't lose your electricity. Meanwhile you have those wonderful feeder birds to watch and i especially like your Song Sparrow picture. I'll bet not everyone gets Song Sparrows as a visitor. Thanks for hosting again, and have a good week ahead. Thank Goodness for the chirpy song sparrow, hope he's announcing the power is back on! We missed the bird count this year so I'm enjoying yours. Hi Eileen, Neat set of pictures. I saw a flock of Sparrows in my back yard area yesterday. Biggest group of Sparrows here yet. I will have to figure out which kind of Sparrow they were. Yes, I did take pictures. I also really like your Carolina Wren! Have an especially pleasant day today! Wspaniałe ptaki udało Ci się zobaczyć. Widok bielika i olbrzymiego stada gęsi jest świetny. Pozdrawiam. Wonderful birds you've seen. View tailed and huge flocks of geese is great. Yours. Again very nice pictures and especially the Blue Jay :-) Also, your other birds I have watched with pleasure. Great captures. I feel so bad for the birds with this never-ending winter. I'm so glad you didn't loose power Eileen, my goodness it looks chilly there. I am sure all your birds are very appreciative of all your feeders.